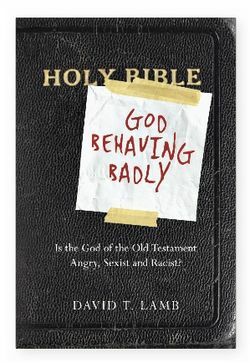 David Lamb’s God Behaving Badly (hereafter GBB) seeks to answer one of the most ubiquitous attacks on Christianity today: Is the God of the Bible evil? Throughout the book, Lamb follows a similar outline through each chapter: introduce tough texts, provide answers, synthesize general remarks. Lamb is unafraid to take on the toughest Scripture passages (1 Sam 4-5; Gen 3; Josh 10, 11, etc.). He points out rightly that people who line up on either side of these issues tend to ignore the texts on the other side. Those who call God angry, racist, sexist, and the like tend to ignore those passages which portray God as loving, welcoming, and empowering. Similarly, too many Christians ignore the ‘tough’ passages. Lamb’s book excels in many specific areas. When discussing issues related to women, Lamb follows William Webb’s “redemptive/progressive” hermeneutic and points out that God is not sexist, but affirming. His treatment of the oft-misunderstood Genesis account is superb. Most interestingly in relation to women in the Bible, he writes, “If it is okay for women to compose sections of the Bible, perhaps we should let them teach it?”(64). Lamb’s scholarship in the Old Testament shines through on numerous occasions throughout the work. He points out the Ancient Near Eastern tendency to utilize hyperbole in descriptions of conquests (77). Is it good that God changes his mind? …If you are a child who deserves to be punished, it is good when a parent changes his mind about your punishment. If you are a car buyer, it is bad when a used-car dealer changes his mind about the low price he had promised (151). The words I wrote in my notes were “gross anthropomorphism.” The reason is because while it may be written that God “changes his mind” it would be very strange to say that He could be compared to the cases Lamb points out. God, knowing the future, would know what was going to happen, and so to say that God is like a parent changing their mind seems a bit out of place. I’ll not delve into a major argument with this, but Lamb brings up the case of Jonah as an example for this. Yet it seems from the book of Jonah that God knew Nineveh would repent–the very reason he sent Jonah in the first place (and the reason Jonah did not initially want to go). For it would not make sense for Jonah to be so upset about being sent to Nineveh to tell them to repent if he felt God would punish them regardless. In any case, this does little to undermine Lamb’s overall argument, but it is worth noting as a flaw. A final note I’d like to make is that Lamb frequently uses God’s divine name. This may be off-putting to some readers who feel it should only be presented as the Tetragrammaton, YHWH. The conclusion of GBB is simply fantastic. Lamb sums up his points in each chapter (a feature I think every conclusion should have). God Behaving Badly is a great introductory look at a well-known challenge to Christianity. Lamb doesn’t ignore the hard issues in the Bible and tackles them with sincerity and intelligence. I recommend the book to those looking to start exploring issues related to God’s moral nature.